Connecting Communities . . . The trails network plan is ready, says the Central Alberta Regional Trail Initiative. Now the long-range hard work across Central Alberta begins. Co-ordinator Deb Comfort spent about a year compiling public input prior to last week's release of the proposed master plan. C.A.R.T. chairman Bill McQuesten has no illusions that the proposed Central Alberta trail network will be ready next September. That's when the TransCanada TrailNet organization had hoped most trails would be user-ready. "I look at this as a real long-term plan. There are some trails that are going in. I think that a lot of these ideas that we've batted around are 10 years down the road. That's how long some will take," he said. "I'd caution on the side of slow-but-sure because you need a strong framework." About six proposed trails in Red Deer County and Lacombe County are in various stages of development. 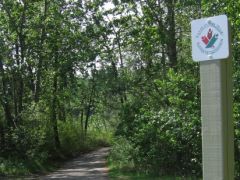 They include a Red Deer-Sylvan Lake route, Blackfalds-to-Burbank subdivision and Heritage Ranch-to-Fort Normandeau trail. The report also recommends some routes not be considered like a trail from Red Deer to Sylvan Lake along an abandoned rail line. The 200-plus pages of the comprehensive report includes positive and negative feedback. A few critical barriers must be crossed before trails are connected together, McQuesten said. "You need a user group who's going to do it at the local level, that's paramount. Where these trails go into place is where the population dictates it," he said. It's "extremely important" for the provincial government to change the controversial Occupiers Liability Act, McQuesten said. It currently permits a trespasser to sue a landowner if the trespasser is injured while crossing private land. "It's one of the main block hurdles to get over," he said. "C.A.R.T. also sees itself as a public information group. We would like to see some progress resolving the issue of trespassing and the liability of it. A lot of (rural) people that are interested in it have to be concerned with their own protection." Alberta TrailNet fully supports changes to the Occupiers Liability Act. McQuesten said Alberta TrailNet's primary focus is and abandoned rail line from Carbon to Wimborne. "They indicated they were not going to drop that," he said. C.A.R.T. proposed an alternate route near Hwy. 2 from Calgary and connecting Olds, Innisfail, Red Deer. "It could include parts of the old C & E Trail. We proposed they include the C & E Trail in the (Alberta) plan," he said. McQuesten thinks the master plan and the overall process has garnered considerable attention from across Alberta. "We've put a foundation of a centralized coordinating group in an area. We're setting the template. A lot of the information we've gathered, Alberta TrailNet is very interested in. We are filling a definite need in the chain of command," he said. "Not wanting to fool anybody, we've got a long way to go." The master plan and trail development strategy involved extensive public input from landowners, municipalities and others. Some 1,400 landowners living adjacent to the concept trails were contacted. A questionnaire was distributed and six public meetings were held to field comments. The Central Alberta Regional Trails Initiative is proposing three trails to municipalities and interested individuals and groups in the counties of Red Deer and Lacombe. Red Deer County council was told last week possible routes are: from the Burbank area to Blackfalds; from Red Deer to Sylvan Lake; and from Heritage Ranch to Fort Normandeau west of the city. Deb Comfort, who co-ordinated the trail master planning project, stressed the favoured trails are only a concept. 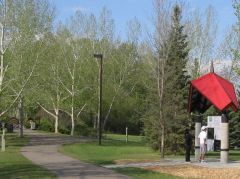 The Burbank-Blackfalds trail is favoured as a safe route for children walking to school, and the Red Deer-Sylvan Lake link has been considered for several years. "I don't anticipate anything happening soon," Comfort said. She added although the majority of people like the trail concept, few want it in their back yard. Privacy, way of life, liability risks, vandalism and disruption of farm operations are concerns. People interested in reading the Central Alberta Regional Trails Society report can contact their local municipal office. It could be a short stroll or a long-distance jaunt but one thing seems certain -- new trails will be developed in Central Alberta. It all depends on the public will, said Central Alberta Regional Trails Initiative co-ordinator Deb Comfort. "This project is basically connecting all these other little (trail) projects with people who are interested in trails and in 20 years would like to see a trail," she said. The plan's mandate and Comfort's role is to develop an inter-community trail master plan for the Central Alberta area by August. "It's a planning project and there's no trail development anticipated," she said. The core idea is to have extensive input from all groups whether they wholeheartedly support trails, hold serious doubts or have a NIMBY (not-in-my-back-yard) attitude. "I'd rather have a 50-50 split than all people wanting trails," she said. The counties of Red Deer and Lacombe will back trail development as long as landowners support it. "Nothing will be submitted that landowners don't want," she said. "This plan I submit in August may have one trail or 50 trails." Finding common ground is filled with numerous challenges, Comfort said. The province's present landowner liability act is considered flawed, but is under review to be revamped. The initial trail plan was started by the Alberta TrailNet group but has allowed the new body to oversee it all. The Central Alberta Regional Trails Initiative will submit specific routes to Alberta TrailNet for consideration as part of the official north-south corridor in the TransCanada Trail. Alberta TrailNet is presently considering having a route go to Calgary from Red Deer, then return southeast to Drumheller. It would head north again towards Stettler along an abandoned rail line and cross over near Camrose and Wetaskiwin. The plan noticeably moves away from communities north of Red Deer. Comfort strongly encourages groups north of Red Deer in the Blackfalds, Lacombe and Ponoka region to submit proposed routes to her before the end of January. "I suspect in the future there will be a loop that will continue north (of Red Deer parallel to Highway 2)," she said. "It makes total sense." "The benefits are endless," she said. "It's wellness, it's active living, anyone can use it, it's easy to maintain." More than 80 people, community groups, agencies and other groups will be contacted by January 30 to provide possible route options. "They'll identify other groups in their communities. For example Delburne has somebody from council sitting on this group and their museum is involved. There's people out there (interested) so it's a matter of tracking them down and getting their input," she said. Other partners include the Normandeau Cultural & Natural History Society (the funding host), Parkland Community Planning Services, Alberta Environment, and the Central Alberta Regional Museums Network. Comfort will facilitate public forums starting in March and April to receive public feedback. By June it's hoped the Regional Trails Initiative will submit a proposed TransCanada Trail route to Alberta TrailNet. A steering committee chaired by Fran Lavoie is aiming for society status to secure continuation of the project. Funding for the project flowed from the Red Deer and District Community Foundation, the Region #78 lottery board and the Region #58 lottery board. Trail boosters could access millennium funds from the federal government and rumoured centennial grant money from the Alberta government. Plans for a Central Alberta trail system are in the works but with no mandate or firm commitment to build, the initiative's path is still uncertain. "I have no idea how many trails are going to be built," said Deb Comfort, co-ordinator of the Central Alberta Regional Trails Initiative. "It's really up to the public to decide how many, what kind, and where trails will be built. "Our goal is to make it easy for people so in the future they don't have to start from scratch." Designed to encourage public participation and foster links between Central Alberta communities, the initiative focuses on potential trails in an area that runs from Bentley and Alix in the north to Bowden and Elnora in the south. The initiative received a $42,000 lotteries grant to support the one-year project, which ends in August. "Public reaction has been overwhelmingly positive," said Comfort. When the master plan is complete in August, municipalities and other interest groups can use it as a blueprint to co-ordinate trail construction, she added. However, the chair of the Central Alberta Regional Trails Stearing Committee, which represents municipalities and special interest groups involved in the planning process, said people shouldn't expect Central Alberta towns and villages to go on a spending spree. "A lot of the municipalities won't be going ahead and spending tax dollars to build trails," said Frank Lavoie. "They are looking for other groups and clubs to undertake the project." The initiative will also submit the plan to Alberta TrailNet for consideration as an official section of the TransCanada Trail's north/south extension through the province.